With a complimentary breakfast an outdoor pool and rooms with free Wi-Fi microwaves and refrigerators the Lexington Inn Hammond offers convenient amenities and quick access to I-55. This two-story Lexington Inn has 53 rooms with free Wi-Fi cable TVs including HBO coffeemakers microwaves and mini-fridges. The hotel's complimentary traditional Southern breakfast includes hot waffles and biscuits and gravy. Soak up some sunshine at the outdoor pool. Save your cell phone minutes as local calls are free. Fax and copy services and a public computer with internet access are available. Non-smoking rooms can be requested. Parking is free. This Lexington Inn is located off I-55 within walking distance of lots of restaurants so you won't have to get back in your car after a long day on the road. 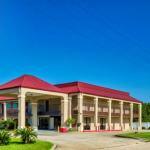 The hotel is three miles from historic downtown Hammond and two miles from Southeastern Louisiana University. Shoppers in need of a fix should check out Hammond Square Mall three miles away which has name-brand stores and a movie theater if you are looking for some rainy-day entertainment. New Orleans is one hour from the property. Louis Armstrong New Orleans International Airport is 40 miles away.